Your day-by-day itinerary now includes Oz Whale Watching as well as Blue Ribbon Day Tours - Blue Mountain Tours. Visiting Manly Beach and Dolphin & Whale Watching will get you outdoors. 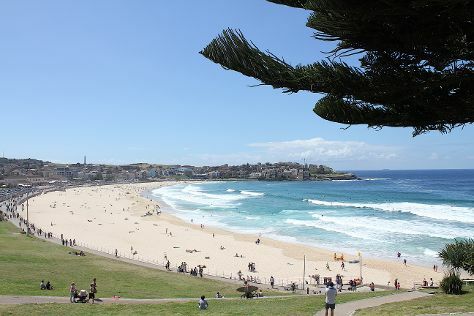 You'll enjoy a bit of beach vacationing at Bondi Beach and Clovelly Beach. Change things up with these side-trips from Sydney: Katoomba (Bridal Veil Falls, The Three Sisters, & more), Jenolan Caves (in Jenolan Caves) and Blackheath (Perry's Lookdown & Wind Eroded Cave). Spend the 13th (Thu) exploring nature at Sydney Harbour National Park. Spend the 23rd (Sun) exploring nature at Blue Mountains National Park Glenbrook. Next up on the itinerary: appreciate the extensive heritage of The Rocks, wander the streets of Darling Harbour, kick back and relax at Shelly Beach, and hike along The Opera House to the Botanic Gardens Walk. For ratings, other places to visit, photos, and other tourist information, go to the Sydney day trip planning tool . If you are flying in from Qatar, the closest major airport is Sydney Kingsford Smith International Airport. In June in Sydney, expect temperatures between 21°C during the day and 11°C at night. Cap off your sightseeing on the 30th (Sun) early enough to travel back home.